This department mainly gives service to their customer. The officers of this department always solve the problem of their customer. Provide information and aware people about the products of ABBL are the main jobs of the officers.  Information provide to the customer about the product. This department involves certain stepwise work flow and observance of separate documentation formalities for each type of account as well as deferent categories of customers. Generally they have to fill some forms are required for opening of an account.  Account Opening Application Form.  Mandates Form, if the account is desired to be operated by a third party Also. Before opening an A/c the bank should obtain satisfactory evidence of the identity of the person intended to open the account as per section 19 Ka of the Prevention of money Laundering Act 2002 & perform due diligence. This process is completed by fulfilling the documentation requirements (Account Application, bank References, Source of Fund & Identification etc.) and also a “Know Your Customer” profile which is used to record a client’s source of wealth, expected trasaction activity at its most basic level. When the person intended to open an account submit all necessary forms and supprting documents and make initial cash deposit as per requirement an account is opened in his/her name. Soon after opening the account a letter of thanks is issued to the customer as per prescribed perform under registered post with A/D.  Copy of valid Trade License issued by Local Govt. authority(City Corporation, Pourashava, Union Parishad etc.).  TIN issued by Income Tax Authority.  The personal identity of the proprietor of the firm has to be established by any of the documents as mentioned in Individual or Joint Customer Category. Extract of the Board resolution sanctioning the account opening and signing authority.  List of the Director with address in form- Xll.  Copy of valid Trade License. Individual or Joint Customer Category. Certified Copy of Partnership Agreement. List of the Partners with address. Copy of valid Trade License. Evidence of the trading address of the business. An explanation of the nature of the business. The Cash Department manages all of incoming and outgoing cash payments.  Maintenance of Specimen Signature Cards.  When branch need money, this department collect money from principal branch.  When branch has excess of money, send the money to the principal branch. Collection of cheques, drafts etc. on behalf of its customers is one of the basic function of a commercial bank. The department which performs this function is known as Clearing Department. Clearing stands for mutual settlement of claims made in between member banks at an agrees time and place in respect of instruments drawn on each other within the same clearing house. Outward clearing means when a particular branch receives instrument drawn on the other bank with in the clearing zone and sends those instruments for collection through the clearing arrangement is considered as outward clearing for that particular branch. When a particular branch receives instruments which are on themselves and sent by other member bank for collection are treated as inward clearing of that branch. Clearing return (outward) includes those cheques which were presented to us the preceding clearing by other banks but we have to return them unpaid to the collecting bank owing to various reason. Return of the 1st clearing are exchange in the special clearing. Clearing Returns (inward) consists of those instruments which were presented by us to other banks for payment in the preceding clearing but we have been returned unpaid by them due to one reason or the other through the Clearing House. Among different services rendered by a commercial bank to its customers, remittance facilities are very important and popular to the customer. It is an important part of GB. Banks extended these facilities by providing quick services towards its clients by means of receiving money from one branch of the Bank and making arrangement for payment to another branch with the country. Remittance means sending of money from one place to another. Remittance facility is extended to the customers to enable them to avoid risk arising out of theft, loss etc. in carrying of cash money from one place to another. Banks take the risk and ensure payment to the beneficiary by charging the customer “Exchange” or “Commission”. This department performs daily functions of collecting and accounting for taxes, receipt of grants and other income, preparing deposits, account analysis, payroll, and processing purchase orders, check requests, paying vendors, monitoring and reporting on grants and budgets and various other projects to assist tribal members, staff and directors with accounting administration. The credit department approves the loan of Corporate Banking division. The approval is mainly based on the risk analysis of the corporate clients done by the Corporate Banking division. The main function is monitoring credit facilities granted by the corporate banking unit. Its function is to make sure that credit has been provided in a right manner. This department ensures that internal controls of the corporate relations are maintained.  To manage ABBL credit portfolio.  Aware people about the credit scheme.  To encourage loan repayment loan.  Collecting from billed customers. The foreign exchange department transfers wherever one currency is traded for another. Foreign exchange held abroad by foreign nationals or foreign business houses, expect to the extent responding earning abroad in respect of business conducted in Bangladesh or service rendered while in Bangladesh.  To open import L/C (letter of credit) and make payment their against.  Verified master L/C and open back to back L/C their against.  Send all types of statement (foreign exchange related) to Bangladesh Bank. Their aim to satisfy all clients, regardless of how big or small they may be. Individuals are counseled on the best type of accounts suitable to them such as Current, Savings, Short Term Deposits, Fixed Deposits, Consumer Asset and Liability Products, etc. Apart from the conventional banking operations ABBL strives to introduce an array of products and services and already launched a number of consumer banking products with the aim of popularizing consumer banking operations and offer higher return to its clients. Savings account generally opened by individuals for saving purposes depositing over a period of time. This type of accounts earns interest at a prescribed rate. Account is eligible for individual’s savings, transaction, investment, loans repayment and payroll purpose. Requirement for personal account: savings and access (single) and graduate account.  AOF: The account opening form (AOF) completed properly.  Photograph: Two copy of account holder photograph duly signed by introducer.  Nominee: Signature of nominee on the AOF along with the relevant portion and also with a photo duly attested by applicant. Any kind of over writing must be signed by applicant in AOF. Name, father’s name, mother’s name, date of birth, address, have to match with supplied documents. Transaction profile and important document are the essential parts of all account opening. Resent Photograph Two copies of A/C holder. Nominee Photograph one copy attested by A/C holder. Passport / Word Commission certificate/ Employee certificate/ Driving license/ Employee ID card. Current account is an efficient and convenient way of handling their daily finances. A frequent transaction of the account that provides customer convenience and flexibility. Put an end to people’s worries about carrying large sums of money when they need it. In the current account, the account holder does not get any interest on deposit money. The account holder can withdraw and deposit his money any branch of ABBL. The minimum deposit is Tk. 5000 to open a current account. A current account may be opened by any firms , companies, clubs, association, corporate body, trust, liquidators etc. Requirement for current account and access (single) and graduate account. Resent Passport Size Two copies Photographs. Fixed deposit is the same as a term or time deposit. Money may be placed with a bank, merchant bank, building society or credit union for a fixed term at a fixed rate of interest which remains unchanged during the period of the deposit. Depositors may have to accept an interest penalty if they break the deposit, ie, ask to take the money out before the agreed period has expired. If the customers need money before the end of their fixed deposit period they can withdraw their money. Short Term Deposit (STD) account heid in this type of accounts shall be payable on short term notice for 7 days or 30 days. Short term deposits are opened by sector corporations, limited companies, firms, NGOs, societies or financial services or institutions etc. These are interest bearing accounts. The rate of interest is fixed by head office. Interest is calculated on daily basis. No overdraft is allowed against STD. Such as, interest rate on the deposit (5%), affordable minimum balance (Tk. 5.00 lac & above) any branch banking. Monthly savings deposit scheme is a liability product where existing and prospective customers can open an account in his/ her name or in the name of minor with an amount of TK. 500/- or its multiple. The client shall have to agree to deposit similar amount on monthly basis for tenure as per the terms agreed upon. The product will be designed by H.O. from time to time. Deposit will be Tk. 500; 1000; 2000; 5000 and multiples of Tk. 5000 thereof. Amount shall come into effect from the 1st week of the month or the subsequent months. Consumer can select a period of 5or10 years, depending on his or her convenience. Customer is eligible to open more than one account in the same branch. Monthly installment of any plan will be debited from customer’s saving or current account as auto transfer arrangement. If the customer fail to pay 3 consecutive installments then the plan will cease to function and payment will be made as per as following clause. For premature encashment, interest will be paid as per prevailing saving rate but no interest will be paid if enchased with in one year. Monthly Income Deposit Scheme is a liability product where the existing customer as well as the prospective customer can create term deposit in his/ her name with a principal amount of TK. 1,00,000/- or its multiple for a tenure of 03 or 05 years and shall be entitled to receive a fixed income on monthly basis as per the terms and conditions of the product. Interest for 3 Years will be 12% & for 5 Years will be 12.24%. Any individual, NGO, Education Institution, Trust, Society etc. may invest their saving in this plan. The customer may open more than one account in the same branch. Minimum deposit is Tk. 1, 00, 000 or in multiples thereof. Subject to a maximum amount of TK. 50, 00, 000 either singly or jointly. Duration will be 3 years and 5 years. For premature encashment, interest will be paid as per prevailing saving rate but no interest will be paid if encashed with in one year. Monthly is subject to tax & other duties which The Govt. of Bangladesh may impose from time to time. Two Photographs will be required for the deposit under this scheme, alongwith a photograph of nominees duly attested by the depositor. In case of death, deposit will be encashed will applicable interest and paid to nominee(s). The customer can avail loan up to 80% of the deposited amount but minimum loan amount against this plan will be Tk. 25,000. “Double your Deposit” scheme allows a customer to double his/ her deposit in 6 Six years at a market competitive rate. The product offers the flexibility of premature encashment at a predetermined. Interest will be paid 12.25% for 6 years. Initial deposit of ABBL DDS is TK. 50,000.00 or its multiples thereof. Subject to a maximum amount of TK. 5, 00,000.00 either singly or jointly. Duration will be 6 years. For premature encashment, interest will be paid as per prevailing STD rate for 6 months, Saving rate for 1 year, 10.50% for 2 years, 11.00% for 3 years, 11.50% for 4 years & 11.75% for 5 years. The loan may be allowed up-to 80% of the principal amount. “Millionaire Scheme Deposit” is a regular savings account with provision for monthly savings for getting the one million on maturity. The monthly savings amount will be fixed based on the tenure of the Scheme account for accumulating deposit for one million. The tenure of the scheme will be Minimum 3 years to 6 years. Any individual, NGO, Education Institution, Trust, Society etc. may invest their saving in this plan. Consumer can select a period of 3/4/5/6 years. Monthly installment income will be debited from the customer saving or current account. The customer can avail loan up to 90% of the deposited amount but the facility will be allowed after one year of opening the A/C. ‘Quarterly Basis Deposit Scheme’ is a fixed deposit account. To increase the deposit base of ABBL at least by 1.00%in 2008. Interest Income is payable on Quarterly basis to the depositor. The tenure of the scheme will be 3 years. The tenor of the deposit will be effective exactly from the date of opening the deposit & not for calendar months. The deposit will be minimum TK. 25000.00. The interest rate of this account is 12.00% . This account also Called ‘Troimashik Munafa Hishab’. Any Existing AB customer, Salaried individuals, Senior citizens, self- employed professionals, Proprietorships, Partnerships etc. The depositor shall have to maintain a Savings / Current / STD account with same branch for disbursement of quarterly interest payable for this account. Govt. Tax at source and Excise Duty shall be borne by the depositor. For premature encashment, before six months no interest will be paid, after six months & before one year interest will be paid as per savings account rate, after one year & before two years interest will be 9.00%, after two years & before three years interest will be 10.00%. ‘Profit First Deposit Scheme’ is a fixed deposit account where interest is paid at the time of deposit. This deposit is also called ‘Ogrim Munafa Patra’ (OMP). A depositor may purchase an OMP certificate by depositing a discounting value. To increase the deposit base of ABBL at least by 1.00%in 2008. The tenure of the scheme will be 12 months. The tenor of the deposit will be effective exactly from the date of opening the deposit & not for calendar months. The deposit will be minimum TK. 25000.00. The interest rate of this account is 12.00%. Tenure of this account is 3/6/12 months. The customer can avail loan up to 90% of the deposited amount. MTB provides a wide range of banking services to all types of commercial concerns such as Import & Export Finance and Services, Investment Advice, Foreign Remittance and other specialized services as required. Although they are a private commercial Bank, they have a strong global network that helps them to undertake international trade smoothly and efficiently. AB Bank is playing a pioneering role among its competitors in providing real time online banking facilities to its customers. AB Bank online banking offers a customer to deposit or withdraw any sum of money from any branch anywhere. Any account holder having a checking account with the bank can avail this service. Based on two-tier client-server architecture, the banking software works basically on central server approach providing the fastest possible access time to any client database from any branch as well as updating the transaction. The branch level server keeping the up to date transaction history of the client ensures the offline transaction ability in case of any failure in the remote communication. Using Microsoft’s enterprise version of SQL Server 2000 as data reservoir, the software ensures the highest level of security at application, network, database and operating systems level ascertaining the confidentiality and security of customer’s personal and account’s information. In order to ensure the safety and accessibility of mission critical data, the Central Data Center of AB Bank is equipped with the state of the art Servers. The recently procured Dell 6600 Server, powered by 4 Xeon processors (RAID5 volume fault tolerance implemented) has been employed as the primary data reservoir of the bank. As a disaster recovery preparation, they have deployed Dell 4300 series Server as Backup server, powered by 2 Xeon processors, which ensures quick fail over of the primary server and smooth operation of online transactions. connected with the central server at its Head Office through Radio Link of 3.5 Frame Relay network and Fiber Optics provided by the country’s leading data communication service provider X-Net Limited, a joint venture company with GrameenPhone. The Bank has recently adopted V-SAT communication system to bring its rural branches under the online branch banking facilities. The V-SAT connectivity is being provided by Square Informatics Ltd. The Society for Worldwide Interbank Financial Telecommunication or S.W.I.F.T. is a worldwide community. 7,800 financial institutions in 200 countries connected to one another through SWIFT. In their own word SWIFT “consistently delivers quantifiable business value and proven technical excellence to its members through its comprehensive messaging standards, the security, reliability and ‘five nines’ availability of its messaging platform and its role in advancing STP. The guiding principles of SWIFT are clear: to offer the financial services industry a common platform of advanced technology and access to shared solutions through which each member can build its competitive edge. AB Bank has already become the member of SWIFT community and has started its operation from March 2002. With introduction of SWIFT, AB Bank ensures its customers the quickest and most secured financial transaction around the world. A debit card is a plastic card which provides an alternative payment method to cash when making purchases. Its functionality is more similar to writing a check as the funds are withdrawn directly from either the cardholder’s bank account (often referred to as a check card). ABBL debit card is start from the 3rd August. The ABBL customer can use the booth of Duch Bangla bank Ltd. Every Debit card has an expiry date. It as well requires replacements. The request for debit card (with prior notification) is dealt by the account service department. Customer collects the card after 5 working days. Customer can easily withdraw cash and make purchases whenever he/she wants using this Debit card. Statement is send to the correspondence address of the account holder in two times a year (June & December). Some time customer need bank statement on urgent basic for some purpose. Then the account holder come to any branch of ABBL and can take the statement. The statement is given when he or she can prove that he or is the account holder or the authorized person of the account holder. He or she can get this statement is office working hour. It is charged from customer’s account. Customers sometime want to change mailing and permanent address. They have to fill up a form and give supporting documents for address alteration (in case of permanent address change). Supporting documents should be photo id (passport/driving license/ voter id) and one copy of photograph of the account holder is required to change any kinds of account service form. This is free of cost. Sometime customer wants to add new person or nominee as joint signatory. Customers have to fill up a form and a signatory card where new applicant’s signature (duly attested by him or her), a copy of passport or voter ID or driving license is required. If a customer wants to change his signature he has to provide his previous valid documents (which were supplied at the time of account opening) and Write an application and copy of photograph with a complete form. If a customer wants to maintain his account he has to pay Bank some charges. For savings and current account- Charge is TK. 500 and VAT is TK. 75 for per six month. Customers have to surrender his cheque-book at the time of closing or surrendering the account. Closing charge is Tk. 300 and VAT is TK.45 for savings and current account. Customer can transfer their account from one branch to another branch of ABBL. For this purpose he or she has to submit an application. The new branch opens a new account with a new account number. This transfer takes maximum 3 days. The transfer charge is TK. 200. Bank provides safety locker service to its customers. Any account holder can obtain it. Account holder needs to fill up a form with specimen signatory card. Signatory may not be more than three. In the form, locker holder must mention the account number from where locker charge will be debited. After clarifications all documents allocation of a locker and key takes place. Locker holder can visit the locker any time within 9 a.m to 5 p. m- from Sunday to Thursday. Customers had to sign the visiting record and locker’s custodian verifies it. If any one wants to surrender the locker, he or she needs to surrender the locker key and visit the locker finally with custodian. The manager keeps the key in the volt and reallocates it. If any one lost the key of the locker, he or she has to pay one thousand take as punishment or for the new key. The credit department approves the loans and advances of Corporate Banking division. The approval is mainly based on the risk analysis of the corporate clients done by the Corporate Banking division. The main function is monitoring credit facilities granted by the corporate banking unit. Its function is to make sure that credit has been provided in a right manner and also ensures that internal controls of the corporate relations are maintained. Advances by commercial banks are made in different such as loan, cash credit, overdrafts, bills purchased, bills discounted etc. These are generally short-term. Advance may be granted against tangible security or in special deserving cases on an unsecured or clean basis. In a loan account, the entire amount, the entire amount is paid to the debtor at one time, either in cash or by transfer to the current account. No subsequent debit is ordinarily allowed expect by way of interest, incidental charges, insurance premium, expenses incurred for the protection of the security etc. Sometimes, repayment is providing for by installment without allowing the demand character of the loan to be affected in any way. Interest is charge on the debit balance, usually with quarterly rests unless there is an arrangement to the contrary. No cheque book is issued. The security may be personal or in the form of shares, debentures, Government papers, immovable property, fixed deposit receipts, life insurance policies, goods etc. Credit Department banking business primarily involves accepting deposits from the public and investing or lending the same and thereby making profit out of it. No single bank can lend out more than its excess reserves, the entire banking system can create a multiple volume of deposit money through credit creation. However, lending money is not without risk and therefore banks make loans and advances to farmers, traders, businessmen and industrialist against either tangible (land, building, stock etc.) or intangible security. Even then, the banks run the risk of default in repayment. Therefore, the banks follow cautious measures while lending money to others. This core function of a Bank is performed by the Credit Department of the bank. At AB bank This Department is known as Relationship Management (RM) and Credit Administration & Monitoring (CAM). The objective of the credit management is to maximize the performing asset and the minimization of the non-performing asset as well as ensuring the optimal point of loan and advance and their efficient management. Credit management is a dynamic field where a certain standard of long-range planning is needed to allocate the fund in diverse field and to minimize the risk and maximizing the return on the invested fund. Continuous supervision, monitoring and follow-up are highly required for ensuring the timely repayment and minimizing the default. Actually the credit portfolio is not only constituted the banks asset structure but also a vital factor of the bank’s success. The overall success in credit management depends on the banks credit policy, portfolio of credit, monitoring, supervision and follow-up of the loan and advance. Modem banking operations touch almost every sphere of economic activity. The extension of bank credit is necessary for expansion of business operations. Bank credit is a catalyst for bringing about economic development. Without adequate finance there can be no growth or maintenance of a stable output. Bank lending is important to the economy for it makes possible the financing of agricultural, commercial and industrial activities of a nation. The credit facilities are generally allowed by the bank may be in two broad categories. When a current account holder is permitted by the banker to draw more than what stands to his credit, such an advance is called an overdraft. The banker may take some collateral security or may grant such advance on the personal security of the borrower. ABBL has given this overdraft facility to its clients. Eligibility: Overdraft facilities are generally granted to businessmen for expansion of their business, against the securities of stock-in-trade, shares, debenture, Government promissory notes, fixed deposit, life policies, gold and gold ornaments etc. Bank may cancel / alter the sanction without assigning any reason whatsoever. In case of client failure to pay the Bank’s dues within the validity of the limit bank may en cash client pledge without any prior intimation to client. Consumer credit, popularly referred to as Consumer Banking, is high value personal banking catering to particular need aspects of individuals, professionals, businessmen among others. Through its large branch network AB has been successful in propagating this personalized banking service to the desired customers. Your Bank’s consumer banking has many diversified products to fulfill customer needs which include Personal Loan, Personal Overdraft, Education Loan, Auto Loan, House Furnishing/Renovation Loan, Home Loan, etc. In the coming months, few more products will be launched for the target group of service holders, entrepreneurs and businessmen in mind. AB recently signed up with a reputed private university to provide Education Loans to students. This particular model will be replicated to other institutions gradually. Recently, your Bank also joined hands with a big name in the jewellery market to re-Launch its product named “Gold Grace”. At present, AB’s clientele base in this segment comprises of 7200 customers having a portfolio size of over Taka 350.0 crore. Clients will procure the specified articles from the dealer/agent/shop(s) acceptable to bank. All the papers/cash memos etc. related to the procurement of the goods will be in the name of the Bank ensuring. Ownership of the goods. Where applicable, the ownership shall be transferred in the name of the clients after full adjustment of Bank’s dues. The client shall have to bear all the expenses of License, Registration, Insurance etc. of the articles wherever necessary. The client shall have to bear the cost of Repair and Maintenance of the acquired articles. When an advance is made in a lump sum repayable either in fixed monthly installments or in lump sum and no subsequent debit is ordinarily allowed except by way of interest, incidental charges, etc. it is called a Time loan. The whole amount of loan is debited to the consumer’s name on a loan account to be opened in the ledger, and, is paid to the borrower either in cash or by way of credit to current/savings account. Eligibility: Loans are normally allowed to those parties who have either fixed source of income or who desire to pay it in lump-sum. Disbursement will be made after completion of all formalities. Bank reserve the right to cancel or amend the terms and condition partly or wholly at is direction without assigning any reason whatsoever. When the principal debtor defaults in fulfilling the obligation or promise liability bestow on guarantor. Term Loan is only provided in selective cases in Bank. The basic characteristic of the loan is almost the same as Time loan except that the repayment period is more than one year. This type of loan is also connected with import facility and is only provided to very selective clients only. Sometimes as per earlier arrangement or under compelling situation we allowed our valued clients to retire the L/C documents without adjusting the demand loan or outstanding BLC. The documents are provided to the client after transferring the outstanding liabilities to T.R account. Eligibility: Loan against trust receipt is generally granted to Exporter for exportation of goods. Disbursement will be made after completion of all formalities as per sanction terms. Suppliers credit report to be obtained before opening of L/C’s. Excess drawing over the sanction limit is strictly prohibited. Customer will maintain effective and constant supervision and follow up to ensure timely adjustment of the loan to avoid overdue. Opening or issuing letter of credit is one of the important services provided by ABBL. A letter of credit is a document authorizing a bank to pay the bearer a specified sum of money; it provides a useful means of settlement for a foreign trade transaction, the purchaser establishing a credit in favor of his credit at a bank. Letter of commercial credit issued for the purpose of facilitating trade transaction. Eligibility: Letter of credit facilities are given to exporter, manufacturers/producers. It should stipulate the name of the loan/credit/Grant. It should bear the name of the designated bank. Items mentioned in the LCA form must contain with the permissible items. The bank officers periodically inspect the goods and verify that they conform to the quantity and quality etc. as mentioned the particular letter of credit. In case of first class customers, the facility may, however be granted against form contracts with overseas buyers. A letter of guarantee has special significance in the business of banking as a means to ensure safety of funds lent to the customers. In case, the borrower is unable to provide the security of tangible assets or, the vale of the assets falls below the amount of the loans, and the borrower’s personal security is not considered sufficient, an additional security is sought by the banker in the form of a guarantee given by a third person. The banks legal adviser must verify all the security documents. When the principal debtor defaults in fulfilling this obligation or promise the liability bestow on guarantor. Bank reserves the right to cancel or amend the terms and condition partly or wholly at its direction without assigning any reason whatsoever. These facilities of credit department of ABBL are divided into three parts: Corporate, SME & Retail. AB Bank provides complete range of solutions to meet Corporate Customers’ requirement. Corporate Banking solutions include a broad spectrum of products and services backed by proven, modern technologies. ABBL specialist teams offer a comprehensive service providing finance to large and medium-sized businesses based in Bangladesh. ABBL have a specialist Structured Finance Team who arrange and underwrite finance solutions including Debt and Equity Syndication for financial sponsors, management teams and corporate. Also we provide corporate advisory services. We aim to provide tailored financing solutions with a dedicated team who can rapidly respond to client needs. In order to cater the demand of client AB Bank has segmented its portfolio in terms of loan size. As per this segmentation any loan over Tk. 10.00 Crore falls under the purview of Large Loan Unit. In AB Bank, there is also a separate Project Finance unit who evaluate the business. The unit is entrusted to handle the portfolio in a focused manner. AB Bank is always in fore front to support establishment of new projects of diverse nature which will help to broaden the manufacturing arena vis-à-vis to generate to employment. Syndication or club financing is a growing concept in Banking Arena of Bangladesh. Syndicated finance diversifies the risk of one bank on a single borrower and increases the quality of loan through consensus or cumulative judgment and monitoring of different banks / financial institutions. AB Bank, the first bank in the private sector also took initiative to adapt to this growing concept. In 1997, AB Bank for the first time arranged a club financing with Dhaka Bank Ltd to raise Tk. 6700 lac – out of which ABBL financed Tk. 5700 Lac and Dhaka bank financed Tk. 1000 Lac. In 1999, AB Bank arranged its second syndicated credit facility with IPDC to raise Tk 3563 Lac. Since then AB Bank did not look back. 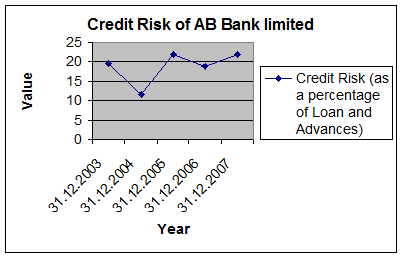 Since 1997 to 2007 (till date), AB Bank has raised total Tk. 25989.56 Lac as Lead Arranger. The following banks from time to time have been our partners in these syndications: Dhaka Bank, IPDC, AB Bank, Bank Asia, Oriental Bank, NCC Bank, The City Bank, Trust Bank, and Bank Asia. AB Bank has also participated in different syndications arranged by other Banks, out of which till date 6 (six) syndication has successfully been completed. AB Bank exposure in these completed syndications was Tk. 4700 Lac. Products Mid Rate Interest rate Band W.E.F. Interest rate on overdraft (OD) under Working Capital & Commercial Lending categories will be higher by 0.50% than that of other funded limits availed by same customer. For lending against ABBL FDR, the rate is 2.00% above the rate of the instrument subject to minimum 13.00%. Exposure under cash collateral of other banks requires clearance from Financial Institutions. A thorough credit and risk assessment is conducted by ABBL prior to the granting of loans, and at least annually thereafter for all facilities. The results of this assessment are presented in a Credit Application that originates from the relationship manager (“RM”), and is approved by Credit Risk Management (CRM). The RM is the owner of the customer relationship, and must be held responsible to ensure the accuracy of the entire credit application submitted for approval. RMs are familiar with the ABBL’s Lending Guidelines and conduct due diligence on new borrowers, principals, and guarantors. It is essential that RMs know their customers and conduct due diligence on new,” borrowers. Principals and guarantors to ensure such parties are in fact who they represent themselves to be. ABBL have established Know Your Customer (KYC) and Money Laundering guidelines which is adhered to at all times. Amount and type of loan(s) proposed. The majority shareholders, management team and group or affiliate companies are assessed. Any issues regarding lack of management depth, complicated ownership structures or inter­-group transactions are addressed, and risks mitigated by ABBL. The key risk factors of the borrower’s industry are assessed. Any issues regarding the borrower’s position in the industry, overall industry concerns or competitive forces are addressed and the strengths and weaknesses of the borrower relative to its competition are identified. Any customer or supplier concentration is addressed, as these could have a significant impact on the future viability of the borrower. An analysis of a minimum of 3 years historical financial statements of the borrower is presented. Where reliance is placed on a corporate guarantor, guarantor financial statements are also analyzed. The analysis addresses the quality and sustainability of earnings, cash flow and the strength of the borrower’s balance sheet. Specifically, cash flow, leverage and profitability are analyzed. Where term facilities (tenor> 1 year) are being proposed, a projection of the borrower’s future financial performance is provided, indicating an analysis of the sufficiency of cash flow to service debt repayments. Loans are not granted if projected cash flow is insufficient to repay debts. For existing borrowers, the historic performance in meeting repayment obligations (trade payments, cheques, interest and principal payments, etc) is assessed. Credit Applications clearly state whether or not the proposed application is in compliance with the ABBL’s Credit Policies. The Bank’s Head of Credit or Managing Director/CEO approve Credit Applications that do not adhere to the bank’s Credit Policies. Mitigating factors for risks identified in the credit assessment are identified. Possible risks include, but are not limited to: margin sustainability and/or volatility, high debt load (leverage/gearing), overstocking or debtor issues; rapid growth, acquisition or expansion; new business line/product expansion; management changes or succession issues; customer or supplier concentrations; and lack of transparency or industry issues. The amounts and tenors of financing proposed are justified by ABBL, based on the projected repayment ability and loan purpose. Excessive tenor or amount relative to business ABBL increases the risk of fund diversion and adversely impact the borrower’s repayment ability. A current valuation of collateral is obtained and the quality and priority of security being proposed are properly assessed. Loans are not granted by ABBL, based solely on security. Adequacy and the extent of the insurance coverage are assessed. Credit proposals are not unduly influenced by an over reliance on the sponsoring principal’s reputation, reported independent means, or their perceived willingness to inject funds into various business enterprises in case of need. These situations are discouraged and treated with great caution. Rather, credit proposals and the granting of loans are based on sound fundamentals, supported by a thorough financial and risk analysis. SME finance in keeping strengthens with the prevailing economic policy of the country. The bank is financing in different sectors of SME sector of the country to a great extent. SMEs are defined in accordance with the prudential regulations or the guidelines of Bangladesh Bank. SME is also defined by the AB Bank. A loan facility for meeting regular as well as additional requirement of businesses; i.e. it will be part of working capital of the business. * Limit will be determined by the stock and/ or volume of sales. It is long term finance for infrastructure development/ capacity building etc. ; i.e. Term loan for expansion. Loan amount will be maximum 80% of the proposed additional investment/ expenditure. Interest Rate: 15% p.a.—17% p.a. Hypothecation of stock and/ or receivables and/ or machineries and/ or furniture and fixture etc. Registered Mortgage of land and building and/or Tripartite agreement for shop or business premises or any other Collateral. Double amount of loan against value of the savings instrument ‘ ABBL FDR, DDS ‘ to meet any type of business requirement. Interest Rate: 8.00% above the instrument interest rate p.a. subject to minimum loan interest rate of 17.00% p.a. Repayment: Through EMI/ Lump sum. Hypothecation of Machineries and/or stock and/or Receivables. Lien of savings instrument ‘ ABBL FDR, DDS ‘ covering minimum 50% of the loan size. PG of the spouse of the borrower. 1 ‘ one ‘ party guarantee. Term loan for CNG Refueling conversion/ Light Engineering/ project finance ‘Package deal including Non- funded’. Loan Amount will be maximum 90% of the value of the imported and/or locally procured machineries. Interest Rate: 15.00% p.a. to 17.00% p.a. Registered Mortgage of Project land and building; additional land. Mortgage free Term Loan for working capital/ fixed investment requirement. Limit will be determined the stock and/or receivables or volume of sales. Maximum 80% of the stock and/or stock value to be finance. Hypothecation of stock and/or Receivables and/or Machineries/ equipments etc. and/or furniture, fixtures and moveable assets. Possession rights of the shop/ business premises. Assignment of advance/ security deposits. Personal guarantee of the spouse and /or other able family members of the borrower. Hypothecation of stock and/or Receivables. Registered Mortgage of land and building and/or any other Collateral. PG of the spouse of the borrower and/or able family member’s. A Loan facility for meting working capital requirement as well fixed investment in businesses for women entrepreneurs. Interest Rate: 14.00% p.a. to 16.00% p.a. Hypothecation of stock and/or book debts. Tripartite agreement for shop or business premises. Target Customer All Clients of ABBL. Tenor Minimum 12 months or Maximum 36 months. Rate of Interest 15.00% p.a. – 16.50% p.a. (subject to type of the security). 2% spread must be maintained in case of own bank FDR. Tenor Revolving with annual review. Rate of Interest 13.50% p.a. – 16.50% p.a. (subject to type of the security). 2% spread must be maintained in case of own bank FDR. Shares of various Companies approved by Head Office from time to time and listed in the Stock Exchange. Term Deposit Receipts issued by any Branch of our Bank. Lien on balance in Savings NC, Current Ale. and other Savings Schemes Government Promissory Notes . Surrender value of Life Insurance Policies. Hypothecation of power driven vehicles or watercrafts. Hypothecation of capital Machineries and equipments. An unsecured loan is one, which is granted to a constituent without obtaining any security subject to restrictions imposed from time to time by Bangladesh Bank or any competent authority. In such case only charge documents are held. Target Customer Employees of reputed Local Corporate, MNCs, NGOs, Airlines, Private Universities, Schools and Colleges, International Aid Agencies and UN bodies, Government Employees, Self-employed Professionals (Doctors, Engineers, Chartered Accountants, Architects, Consultants), Businessmen. Purpose Marriages in the family, Purchase of office equipment / accessories, Purchase of miscellaneous household appliances, Purchase of Personal Computers, Purchase of audio-video equipment, Purchase of furniture. Purpose To purchase Brand new vehicle, non-registered reconditioned vehicle. Loan Amount 70%for the brand new car 60% for the reconditioned car but must not exceed TK.1.00 lac. Purpose Marriages in the family, Purchase of office equipment / accessories, Purchase of miscellaneous household appliances, Purchase of Personal Computers, Purchase of audio-video equipment, Purchase of furniture, Advance rental payment, Trips abroad, Admission/Education fee of Children etc. Purpose To purchase ornaments/Jewelry for personal use only. Purpose House/Office Furnishing/ Renovation, For interior decoration / Titles Stones, Electrical fittings, wooden cabinets / Overall furnishing and all types of House/Office Renovation, purchase/furnishing of apartments etc. Loan Amount MinimumTk.1.00 lac & Maximum Tk. 10.00 lac. Target Customer Students of repotted Educational Institutions- Public & Private Universities, Medical colleges, Engineering Institutions. Professional degrees like -CA, ICMA, MBA, MBM, PHD, FCPs etc. Processing fee: 1% on the approved loan amount or Tk. 2000.00 whichever is higherTenorMinimum12months & Maximum 36 months.Rate of Interest14.00% to 17.00% p.a.SecurityOffer latter from related institutions. Original Certificates, Conformation from Head of Deptt. /Dean/Principal, One guarantor to be same level or higher than the customer. Age must be 17 to 40 years, Names of referees acceptable to the Bank. Rate of Interest 15.50% p.a. Target Customer All Clients of VISA Credit Card of ABBL. Loan Amount For VISA Classic TK.0.10 lac to 0.50 lac & for VISA Gold TK. 0.51 lac to 5.00 lac. Tenor 36 months & renewable. Rate of Interest 2.000% p.a. Security Hypothecation of the product to be purchased. Applicant applies for the loan in the prescribed form of Bank. The purpose of this forms is to eliminate the unwanted borrowers at the first sight and select those who have the potential to utilize the credit and pay it back in due time. Confidential report from other bank/ Head office/Branch/Chamber of commerce. Bank then starts examination that whether the loan applied for is complying with its lending policy. If comply, than it examines the documents submitted and the credit worthiness. Credit worthiness analyses, i.e. analysis of financial conditions of the loan applicant are very important. Then bank goes for Credit Risk Grading (CRG) and spreadsheet analysis, which are recently introduced by Bangladesh Bank. According to Bangladesh Bank rule, CRG and SA is must for the loan exceeding Dhaka core. If these two analyses reflect favorable condition and documents submitted for the loan appears to be satisfactory then, bank goes for further action. Credit Information Bureau (CIB) of Bangladesh bank has a central database for all the lenders of Bangladesh. It contains the total credit history of a client and act as the most dependable source to analyze the credit worthiness of a prospective client. Obtaining the CIB clearance is a precondition of fund disbursement and all type of Retail, SME and corporate loan require CIB report before disbursement. For some retail unsecured assets, BBL obtains post-facto CIB clearance. However, in most cases AOD obtains the CIB for a client before disbursement of fund. These forms are filled up by the business units and sent to the CIB segment of AOD. CIB segment maintains a central database for all the CIB inquiry forms. Each form is registered under a Head Office serial number and a Branch/ Unit office serial number. Therefore AOD prepares a forwarding letter with reference to 20 such inquiry forms, and sent them to Credit Information Bureau of BB once in a day. Usually the CIB reports are received within 7-10 working days. After receiving the reports from BB, AOD prepares a summary of the report and put that as reference in the loan file along with the photocopy of the CIB inquiry forms, undertaking and copy of the original CIB report. For any mistakes made in the forms, writing wrong spelling, incomplete name of individuals or institutions, CIB report may show error as mismatch exists there. Those CIB inquiry forms require to be sent again correcting the facts. CIB reports are usually updated quarterly and half-yearly. Therefore most updated CIB reports are required to be obtained and CIB report is also require for the same client for repeat loan. All forms need to be supported by the Applicant’s Undertaking and all the forms are signed by designated officers of the business division; e.g. Relationship manager for Corporate Application. Sales Manager for Retail Application. Credit Risk Officer for SME Application. The designated officers also require to attest the undertaking form “KA” filled up by the loan applicant (individual/ institution/ group). CIB information for Group is mainly required for the corporate loan applications. CIB is a regulatory requirement for Loan Documentation. Request for Credit limit of customers. Project Profile / Profile of Business. Copy of Trade License duly attested. Personal Net worth Statement of the Owner/ Director/ Partner/ Proprietor in Bank’s Format. Valuation Certificate in Bank’s Format along with photograph of collateral security (land & building with detail particulars on the back duly authenticated by the Branch Manager. In case the value of the property offered as security exceed Tk.5O.OO lac, the value to be assessed by bank’s enlisted surveyor and report thereof to be obtained. 3 years Balance sheet and profit and loss A/C. cm Enquiry Form duly filled in (For proposal of Tk.l0.00 lac and above) CJ Lending Risk Analysis for Credit facilities of Tk.50.00 lac and above. Inspection/Visit Report of Factory/Establishment/Business premises of the customer. Credit Report from other Banks. Statement of A/C (CD/SB/CC) for the last 12 months. In case the customer maintaining account with other Bank, Statement of Account for the last 12 months of the concerned Bank should be furnished. In case of renewal/ enhancement of credit facility, Debit Turnover, Credit Turnover Highest drawing, lowest drawing, and Total income earned detailed position of existing liabilities of the customer i.e. Date of sanction. Date of expiry, Present outstanding, Remarks, if any. Declaration of the customer of the name of sister/allied concerns and liabilities with other Banks, if any, and an undertaking to the effect that they have no liability beyond those declared. In case of L/C proposal, detailed performance of L/C during the last year i.e. No. and date of L/C opened, commodity, L/C value, etc. Whether the applicant is Shareholder/Director of AB Bank Ltd. as per definition or Banking Companies Act. Financial Analysis to be prepared by the Branch Manager based on the financial performance of the company which should show trends in sales/profitability, liquidity, leverage etc. It should also contain an assessment of the competence and quality of the business management, the general economic & competitive environment of the borrower’s industry and any other pertinent factors that is relevant for management’s credit decision. The proposal contains all pertinent information relating to the proposed facility and the borrower. All necessary papers and documents have been submitted. The proposal has been duly signed by the members of the Branch Credit Committee including the Manager. The proposal has been duly recommended. The proposal does not fall within the existing credit restriction. Minimum margin requirement against the credit facility has been proposed. The primary security has got easy marketability, durability and storability. The value of the propel1y offered as collateral security is judiciously assessed. The proposal is viable and stands all credit tests. The proposed borrower is not defaulter of any Bank/Financial Institution. There is no request from other Bank/Financial institution for not allowing/stoppage or facility to the prospective borrower. The proposal meets all the provisions/requirement of Bank Companies Act/Rules of Bangladesh Bank/Other Laws / Rules. Where the proposed accommodation in the form of working capital may be considered on the project financed by any other Bank including DFI. Favorable status report and No Objection Certificate (NOC) from the financing Institution to be obtained. Where 2nd charge on the fixed and floating assets (in case of a limited company) or 2nd mortgage on real estate is offered, clearance in respect of creation of 2nd charge on the property together with confirmation that documents will be held by them on behalf of the Bank and that they shall not part with the same without consent of the Bank, is obtained from the 1st mortgagee. 1. Letter of Borrower requesting for new facilities/renewal. 2. Authority of borrow to borrower (Later of authority from partners in case of partnership concern and resolution in case of limited company) with list of partners/ Directors. From XII certified by RJSC regarding list of existing directors for limited company. Facilities Advice Letter: accepted unconditionally by browser. Deed of Partnership (for partnership borrower/third party), B-Laws etc. Memorandum & Articles of Association (for limited company borrower/third party) with certificate of incorporation. Resolution to lien account (for third party/partnerships and limited companies). Letter of Lien & set-off (Pledge Agreement. Resolution to deposit (for third party/partnerships and limited companies). Fixed Deposit Receipts/Sanchayapatras/Bonds/MIDS endorsed by holder(s). Letter of Guarantee by depositors (if the deposits stand in the name of third party). Letter of Lien & set-off (Pledge Agreement). Letter of Authority for encashment of Fixed Deposits/Sanchayapatra(s)/MIDS. Resolution to deposit (for third party/partnerships and limited companies. Bank Transfer forms for each share certificate (From 117). Memorandum of deposit of shares. Letter of Guarantee by the Shareholder (if the share stands in the person other than borrower). Irrevocable Letter of Authority for collection of dividends, bonus etc addressed by the shareholder to the related company. Notes of Pledge by the shareholder to the related company. Letter of disclaimer (if required). RJSC Search report (for limited companies/partnerships borrower/third party etc). RJSC from 18, and receipt of filing with RJSC. Certificate of registration from RJSC. Modification of letter of pledge/Pledge Agreement of inventory. RJSC From 19 and of filling with RJSC. Insurance Policy with ABBL and jointly insured. Resolution to hypothecate (for third party/partnerships and limited companies. Notification and acknowledgment of assignment and confirmation of receivables from the debtors. Head of Credit Risk Management Division and Legal Counsel approval documents. When the credit proposal are approved the credit officer must have to be ensured that the disbursement of the credit facilities must comply with the directions written in the credit policy and circular made by time to time along with checking all the following terms and conditions. The officer of Loan Administration must collect the acceptance of the customer’s of the terms and conditions on the duplicate copy of the sanctioned advice. They will thoroughly examine and ensure that the subject credit facility does not contradict to any law, rules and regulation of the country, Bangladesh Bank and Deed of the Mortgage and power of the Attorney to be drafted and executed under the Supervision of the Bank’ s Legal Advisor. Lawyers certificate to the effect that all the legal formalities (Equitable/ Registered Mortgaged) has been properly created on the land and building in favor of the bank & bank has acquired the effective title of the property. Registered power of attorney has been collected form the borrower (contractor) assigning the work order favoring the ABBL and the power of attorney has been registered with the work order given agency and they have agreed that they will issue all the cheques favoring ABBL .The legal documents of the vehicle have been obtained. Collection of the satisfaction certificate in respect of all the documents both legal and banking from the lawyer.Entry has been made in the Safe -in and Safe-out register and the documents are preserved. After being satisfied all the above terms and conditions the credit in-charge will disburse the loan amount to the client. ABBL adopts a credit risk grading system. The system defines the risk profile of borrower’s to ensure that account management, structure and pricing are commensurate with the risk involved. Risk grading is a key measurement of a Bank’s asset quality, and as such, it is essential that grading is a robust process. All facilities are assigned a risk grade. Where deterioration in risk is noted, the Risk Grade assigned to a borrower and its facilities are immediately changed. Borrower Risk Grades are clearly stated on Credit Applications. Facilities are fully secured by cash deposits, government bonds or a counter guarantee from a top tier international bank. All security documentation should be in place. Assets graded 8 are long outstanding with no progress in obtaining repayment (in excess of 180 days past due) or in the late stages of wind up/liquidation. The prospect of recovery is poor and legal options have been pursued. The proceeds expected from the liquidation or realization of security may be awaited. The continuance of the loan as a bankable asset is not warranted, and the anticipated loss should have been provided for. This classification reflects that it is not practical or desirable to defer writing off this basically worthless asset even though partial recovery may be affected in the future. Bangladesh Bank guidelines for timely write off of bad loans must be adhered to. An Aggregate Score of 35 or less based on the Risk Grade Scorecard At least top twenty five clients/obligors of the Bank may preferably be rated by an outside credit rating agency. The Early Alert Report is completed in a timely manner by the RM and forwarded to CRM of ABBL for approval to affect any downgrade. After approval, the report is forwarded to Credit Administration, who is responsible to ensure the correct facility/borrower Risk Grades are updated on the system. The downgrading of an account is done immediately when adverse information is noted, and is not postponed until the annual review process. After the date of expiry, if the borrowers do not adjust their loan, ABBL at first gives a notice to them. The period of giving notice depends on the nature of the loan. For continuous loan, ABBL gives notice for three months. For five-year term loan, ABBL gives notice for six months. And for more than five-year term loan, ABBL gives notice for more than 12 months. After giving notice, if the borrower does not repay the loan, the loan will be considered as classified. The loan account is performing satisfactorily in the terms of its installments and no overdue is occurred. This type of loan and advances are fall into this class. This classification contains where irregularities have been occurred but such irregularities are temporarily in nature. To fall in this class the loan and advance has to fulfill the following factor. S-T Agri & Micro Credit3 months & above but less than 6 months.Continuous loan Demand LoanUn-recovered for 3 months & above but less than 6 months from the date of the loan is claimed. Fixed Term loanRepayable within 5years: If the overdue installment equals or exceeds the amount repayable within 6 months.Repayable more than 5years: If the overdue installment equals or exceeds the amount repayable within 12 months. The main criteria for a substandard advance is that despite these technicalities or irregularities no loss is expected to be arise for the bank. These accounts will require close supervision by management to ensure that the situation does not deteriorate further. This classification contains where doubt exists on the full recovery of the loan and advance along with a loss is anticipated but can not be quantifiable at this stage. Moreover if the states of the loan accounts fall under the following criterion can be declared as doubtful loan and advance. S-T Agri & Micro Credit6 months & above but less than 12 months.Continuous loan Demand LoanUn-recovered for 6 months & above but less than 12 months from the date of the loan is claimed. Fixed Term loanRepayable within 5years: If the overdue installment equals or exceeds the amount repayable within 12 months.Repayable more than 5years: If the overdue installment equals or exceeds the amount repayable within 18 months. S-T Agri & Micro CreditNot recovered within more than 12 months.Continuous loan Demand LoanUn-recovered more than 12 months from the date of the loan is claimed. Fixed Term loanRepayable within 5years: If the overdue installment equals or exceeds the amount repayable within 18 months.Repayable more than 5years: If the overdue installment equals or exceeds the amount repayable within 24 months. To issue legal notice for filing suite. To issue legal notice for selling the hypothecated goods (in case of transport loan, cash credit-hypo). To issue suite for foreclosure. Finally to sue in money loan court or insolvency court which is suitable. Banking is essentially a business dealing with money and credit. Like every other business activity, banks are profit oriented. A bank invests its funds in many ways to earn income. The bulk of its income is derived from loans and advances. On the other hand, this (loan) is also the major source of risk for the bank management. A prudent bank management should always try to make an appropriate balance between its return and risk involved with the loan portfolio. Credit risk is the possibility that a borrower or counter party will fail to meet its obligations in accordance with agreed terms. Credit risk, therefore, arises from the bank’s dealings with or lending to corporate, individuals, and other bank’s or financial institutions. Credit risk management needs to be a robust process that enables banks to proactively manage loan portfolios in order to minimize losses and earn an acceptable of return for shareholders. Given the fast changing, dynamic global economy and the increasing pressure of globalization, liberalization, consolidation and dis-intermediation, ABBL has robust credit risk management policies and procedures that are sensitive and responsive to these changes. This policies help its to improve risk management culture establish minimum standards for segregation of duties and responsibilities arid assist to identify the volume of risk and can take positive steps to control the risk as soon as possible. • Oversight of the bank’s credit policies, procedures and controls relating to all credit risks arising from corporate/ commercial/ institutional banking, personal banking, & treasury operations. • Oversight of the bank’s asset quality. • Directly manage all Substandard, Doubtful & Bad and Loss accounts to maximize recovery and ensure that appropriate and timely loan loss provisions have been made. • To approve (or decline), within delegated authority, Credit Applications recommended by RM. Where aggregate borrower exposure is in excess of approval limits, to provide recommendation to MD/CEO for approval. • To provide advice/assistance regarding all credit matters to line management/RMs. • To ensure that lending executives have adequate experience and/or training in order to carry out job duties effectively. The Credit Administration function is critical in ensuring that proper documentation and approvals are in place prior to the disbursement of loan facilities. For this reason, it is essential that the functions of Credit Administration be strictly segregated from relationship management in order to avoid the possibility of controls being compromised or issues not being highlighted at the appropriate level. • To ensure that all security documentation complies with the terms of approval and is enforceable. • To monitor insurance coverage to ensure appropriate coverage is in place over assets pledged as collateral, and is properly assigned to the bank. • To control loan disbursements only after all terms and conditions of approval have been met, and all security documentation is in place. • To maintain control over all security documentation. • To monitor borrower’s compliance with covenants and agreed terms and conditions, and general monitoring of account conduct/performance. Documentation can be described as the process or technique of obtaining the relevant documents. In spite of the fact that banker lends credit to a borrower after inquiring about the character, capacity and capital or the borrower, he must obtain proper documents executed from the borrower to protect him against willful defaults. Moreover, when money is lent against some security of some assets, the document must be executed in order to give the banker a legal and binding charge against those assets. Documents contain the precise terms of granting loans and they serve as important evidence in the law courts if the circumstances so desire. That’s why all approval procedure and proper documentation shall be completed prior to the disbursement or the facilities. Charge over bonds or certificate of shares etc. Having completely and accurately prepare the necessary loan documents, the loan officer ready to disburse the loan to the borrower’s loan account. After disbursement, the loan needs to be monitored to ensure whether the terms and conditions of the loan fulfilled by both bank and client or not. Credit monitoring and review is very important, because it ensures proper utilities and repayment of Bank fund. The success of the loan schemes depend on the extensive and intensive post disbursement supervision, follow-up & monitoring. It must be ensured that the loan fund is not diverted, the sponsors are very serious to the operation of the project, quality is updated and marketing effort is effective. Regular repayment must be ensured. Visit to the establishment must be done at least once in a month. During visit of the project motivational work to be done with a view to strengthening the spirit & morale of the sponsors. A visit report should be recorded in credit file against each visit. Supervision will be done by the respective branches, which will be monitored by RM and CAM department, Head Office. A signboard shall be displayed at the shop / factory with writing “Financed by AB Bank Limited”. So, Credit monitoring implies that the checking of the pattern of use of the disbursed fund to ensure whether it is used for the right purpose or not. It includes a reporting system and communication arrangement between the borrower and the lending institution and within department, appraisal, disbursement, recoveries, follow-up etc. b) The information regarding the profitability, liquidity, cash flow situation and trend in sales in maintaining various ratios. 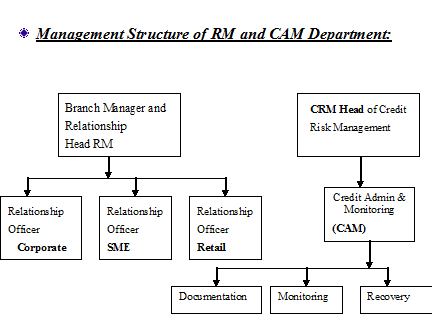 The review and classification of credit facilities starts at RM and CAM Department of the Branch with the Branch Manager and finally with RM and CAM Department – Head Office. If any borrower fails to adjust the loan within validity period or to repay his monthly installment then the responsible loan-monitoring officer of the concerned branch will arrange for adjustment of the overdue installments from the loaner’s savings account if there is adequate balance. The officer shall regularly follow up for recovery and take any measure including legal action for recovery. 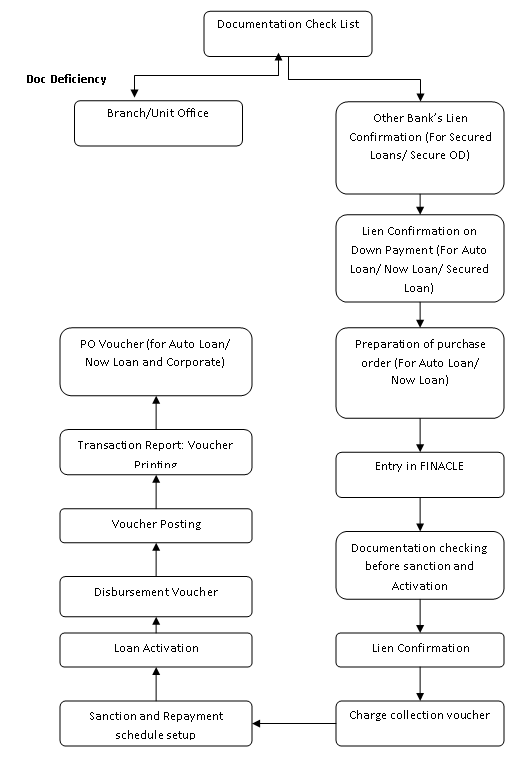 If any loaner fails to repay his consecutive 02(two) monthly installments, then the Branch’s loan monitoring officer will investigate into the actual causes of default and report to the Branch Manager with a copy to SME Cell, Head office for further action and advice for recovery/ regularization of the loan . The SWOT analysis comprises of the organization’s internal strength and weaknesses and external opportunities and threats. SWOT analysis gives an organization an insight of what they can do in future and how they can compete with their existing competitors. This tool is very important to identify the current position of the organization relative to others, who are playing in the same field and also is used in the strategic analysis of the organization.  Cooperation with each other.  Lack of experience employees in junior level management.  Tendency to leave the bank in quest of flexible environment.  Lack of proper motivation, training & job rotation.  More focus on Dhaka and Chittagong.  The company gives online banking service but only cash tractions.  Deposit is more then the advances.  ABBL has not that much good market share then the other commercial bank.  Growth of sales volume.  They can launch new ATM card services.  Expanding the company’s product line to meet a broader rage of customer needs.  Change in political environment.  Other commercial bank and the multi-national companies.  Political instability and corruption are threatening Bangladesh’s economy.